The ASA is passionate about having a national programme with national minimum standards but insist teachers should not teach using the outcomes as their syllabus. Each programme should identify the needs of their swimmers and can add additional outcomes/ awards and criteria to their class structure to help swimmers to progress. By adding diversity to their programmes they also help swimmers progress between the stages better and keep swimmers motivated. Any additional aquatic outcomes are encouraged as long as they are appropriate and well communicated to teachers and parents/ swimmers so all involved understand the criteria for each class. 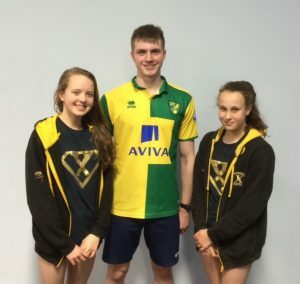 The Stages are the bread and butter and the swimming essentials additional criteria/ awards to each class which add the challenges, fun and diversity to help swimmers stay in the programme. In order for this scheme to work successfully for the club, we have taken the basic core programme at each stage slightly adapted the criteria to include a few swim skills at each stage in addition to the basic core skills. As a basic guide the children are introduced as beginners into Stage 1. When they become water confident, will fully submerge and are able to kick across the teaching pool (8 metres) on their front and back with aids they move to Stage 2. When they can kick 8 metres on their front and back without aids/floats they move to Stage 3. Whilst in Stages 1 and 2 we introduce submersion skills, push and glides and floating. Over arm recovery and symmetrical leg action may also be introduced. In Stage 3 we continue to develop over arm recovery on front and back crawl. We aim to achieve a good leg kick – with only a small amount of kneebend. We also introduce/develop breaststroke leg action with feet turning out, 360o rolls and tucked floating. Stage 4 continues to develop front and back crawl and breaststroke. Before moving to Stage 5, the swimmer has to demonstrate a correct breaststroke symmetrical leg action. Swimmers will also be assessed in the main pool to demonstrate that they are comfortable with a lesson in deeper water. back crawl and breaststroke. Front crawl should preferably demonstrate bilateral breathing. Breaststroke should be co-ordinated and feet dorsi-flexed (turned out on the kick phase). All lengths should be completed without undue stress. Stage 7 is similar to Stage 6 but swimmers can complete a length of each stroke in a faster time. The ASA Technical Rules are introduced for each stroke (eg starts, turns, finishes). In the water relay take-overs should be practised in the small pool lessons. The underwater breaststroke (start/turn) phase should be introduced and developed in stages 7 and 8. Stages 8, 9 and 10 introduce the swimmers to training methods. 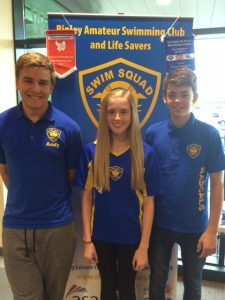 Before moving into squad swimming we expect the swimmer to have knowledge of ASA Technical Rules in respect of starts, turns and finishes. We teach diving from the poolside and some swimmers will achieve the Preliminary Competitive Start Award during these sessions. (The full Competitive Start Award is taught and awarded by the Head Coach during squad training.) The swimmers are also taught lane discipline (although I know most of them would deny this) and introduced to the use of the pace clock and checking their pulse rates. As swimmers improve, the number of lessons and training sessions per week will increase. The number of children in each class is dependent upon their ability and size of pool available. As a general guide there are eight pupils in small pool lessons. Stages 6 and above swim in 25m pools and therefore the number of pupils can be higher than ten with increased staffing ratios as required. The number of classes of each grade is dependent on the number of children within that stage. We aim to make the stages/classes fit the children – not the children fit the classes.